How is oligohydramnios (low amniotic fluid) diagnosed? A: Ultrasound testing for amniotic fluid volume is the best way to test for oligohydramnios. This test is conducted along with tests for the baby’s general well-being, such as the biophysical profile (BPP) and nonstress tests (NST). While ultrasound testing is the only clinically practical way to measure amniotic fluid volume, a test called the amniotic fluid index (AFI) is sometimes also used. Amniotic fluid is a clear liquid in the amniotic sac that surrounds and protects the baby during pregnancy. Initially, the fluid consists mainly of water. At approximately 20 weeks, the baby’s urine becomes the primary substance. The baby breathes and swallows amniotic fluid, which aids in nutrition, lung maturation, growth, and maintaining a consistent temperature. The volume of amniotic fluid increases during pregnancy and reaches its peak at about 34 weeks. When the volume of amniotic fluid decreases and becomes inadequate, it is called oligohydramnios. Oligohydramnios is a very serious condition that is associated with intrauterine growth restriction (IUGR), cord compression, hypoxic-ischemic encephalopathy (HIE), cerebral palsy, uteroplacental insufficiency, premature rupture of membranes (PROM), preterm birth, meconium aspiration, preeclampsia, and placental abruption. Oligohydramnios may first be suspected when the size of the mother’s uterus (womb) is less than expected for the gestational age. Ultrasound assessment of amniotic fluid volume can take place in the first trimester, although fluid assessment at this stage is rare. It also is rare to find low amniotic fluid before a baby is 10 weeks of gestation. If a baby has low amniotic fluid in the first trimester, it is very likely that the baby will suffer a poor outcome. Amniotic fluid testing should begin at 32 – 34 weeks of gestation when the mother has a moderate to high-risk pregnancy (an increased risk of stillbirth). When the mother has a high-risk condition or multiple complicating factors that put her baby at risk, testing should begin earlier. Amniotic fluid testing is typically done along with other prenatal tests, such as the biophysical profile (BPP) and the nonstress test (NST), which are tests that evaluate the baby’s breathing, heart rate, movement, and muscle tone. These tests provide an overall assessment of the baby’s well-being. If the SDP is 0 – 2 cm, the baby has oligohydramnios. If the SDP is 2.1 – 8cm, amniotic fluid levels are normal. If the SDP is greater than 8 cm, the baby has polyhydramnios. An AFI of 5 cm or less is abnormal. However, a sudden decrease in amniotic fluid or a significant decrease over a short period of time is considered abnormal even if the AFI is greater than 5 cm. When a baby has a BPP score of 8 out of 10 points, and decreased amniotic fluid is the reason for the loss of the points, the baby is at high risk for chronically low oxygen levels and sudden decompensation. The baby must be closely monitored, and low amniotic fluid should be managed. Once a week if they are less than 41 weeks of gestation and the AFI is 8 cm or higher. Twice a week if the AFI is 5 – 8 cm at less than 41 weeks (If this occurs, the mother is at high risk of AFI being 5 cm or lower within 4 days). All mothers at 41 weeks of gestation or higher should have twice-weekly AFI assessments with a modified BPP, but the frequency of testing should be based on the clinical circumstances of each mother. Thus, the more unstable the condition of the baby, the more frequent the testing. In addition, when oligohydramnios is present, BPP should be performed more frequently than once per week, and in many cases, a BPP may need to be performed every day. All mothers diagnosed with oligohydramnios should undergo an NST and AFI or BPP once or twice weekly until delivery (especially in cases in which the cause of oligohydramnios is unknown), depending on the condition of the mother and the baby. Amniotic fluid volume is less than 500 mL at 32 – 36 weeks gestation. Doppler blood flow studies (studies in which physicians can view and assess the mother and baby’s blood vessels) that show problems with blood flow in the placental circulation and redistribution of blood flow in the baby’s circulation. This indicates uteroplacental insufficiency, which is a risk factor for oligohydramnios. 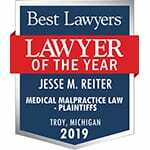 If you had oligohydramnios (low amniotic fluid) and your child was diagnosed with a birth injury such as cerebral palsy, a seizure disorder, or hypoxic-ischemic encephalopathy (HIE), the award-winning birth injury attorneys at Reiter & Walsh ABC Law Centers can help. We have helped children throughout the country obtain compensation for lifelong treatment, therapy, and a secure future, and we give personal attention to each child and family we represent. 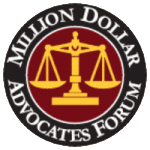 Our firm has numerous multi-million dollar verdicts and settlements that attest to our success, and no fees are ever paid to our firm until we win your case. Email or call Reiter & Walsh ABC Law Centers at 888-419-2229 for a free case evaluation. We are available 24 / 7 to speak with you. Watch birth injury lawyers Jesse Reiter and Rebecca Walsh discuss the causes of birth asphyxia and hypoxic-ischemic encephalopathy (HIE).